Congressional hearings have become very controversial and contentious. President Obama’s nominees for cabinet positions must answer over 1000 questions by Republican lawmakers. Governmental officials involved in scandals must answer hundreds of questions as well. This practice of intense questioning is often referred to as grilling the officials. This is a common metaphor based on our experiences with cooking food on a barbecue or hot grill. Here is a little more information on grilling and other cooking metaphors. 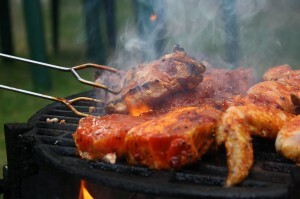 Meat can be cooked on a hot barbecue grill. The grill must be very hot to cook the meat safely. In metaphorical terms, to grill someone means to ask them very tough questions which make them uncomfortable as if they are on a hot grill. Example: In every presidential debate, the moderator grills the candidates to find out their views on important issues. When meat is cooked on hot grill, it makes a popping noise called sizzling. In metaphorical terms, when something is exciting or eventful, we can also say that it sizzles. Example: During the 2008 presidential election, the newspapers and television stations were sizzling with anticipation of having the first African-American being election president of the United States. Example: John McCain was skewered by some liberal critics for choosing Sarah Palin as his running mate when she had very little international political experience. Conservative critics, however, skewered Barack Obama for the same reason. 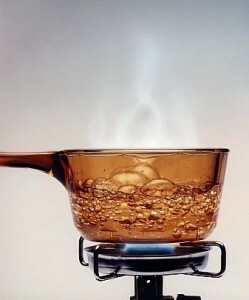 Some recipes require that one stir up or whip up a liquid batter before the food is cooked. Metaphorically, to whip up something means to create something out of nothing or very little. In politics there may be positive or negative meanings for either of these phrases. In a positive sense, a candidate or politician may need to whip up a new policy or program to satisfy the public. In a negative sense, an event or a person may stir up trouble, such as anti-American sentiments, or criticism against his or her opponent. Example: The terrorist attacks on September 11, 2001 whipped up fear and criticisms of people from the Middle East. Some dishes require that one cooks the food on low heat for a long time. This is called simmering. In metaphorical terms, one can have a long-simmering problem meaning that the issue has been slowly getting worse for many months or years. Example: The wars between Israel and Palestine have been caused by long-simmering disputes over land. When one makes a soup from scratch, one may need to boil it so that it some of it evaporates and the soup can retain strong flavor from its meat and vegetables. In this case, one case that the soup is boiled down to its basic ingredients. In popular terms, we say that something complicated boils down to a few simple ideas. Example: The differences between Democrats and Republicans often boil down to differences in the role of government in the lives of everyday people. In a business setting, the records for profits and losses are sometimes called the books. This idea is found in the terms bookkeeping. However, if a company’s accountants are not honest about their financial records, we may say that they are cooking the books. Example: Some critics of Barack Obama claimed that he was cooking the books with the good unemployment figures that came out just before the 2012 election. Many people follow recipes when cooking to make sure they have the correct quantities of each ingredient. In popular terms, one might also have a recipe for a disaster, meaning a certain situation has all the characteristics necessary to cause something bad to happen. Example: In 2003, some liberals complained that invading Iraq was a recipe for a disaster. The long, bloody war that followed may have proved them right. If one makes a dinner or dessert without using a package or box from the store, we say that one is cooking from scratch, meaning starting from nothing. In popular terms, to start something from scratch means that one is beginning a new project without using previous plans or successful projects. Example: Politicians must sometimes start from scratch when developing economic plans for a fast-changing financial system.